The Hike: The start of the trail is marked on the map with the waypoint labeled "Trail Head". Here you'll find a large sign with a map of the entire Greenbelt. In total there are probably about 15 miles of trails listed. There are some additional trails not shown on the map, as you'll soon see. The first part of the trail curves toward the creek itself and when you get there you'll be directly across from the creek from a large vertical rock face, marked on the map with a waypoint called "Rock Face". On this particular hike there were two groups of mountain climbers scalling different sections of the rock face. The trail along this stretch of the creek is easy. Rather flat and wide enough for at least two to walk side by side. The established trail crosses the creek at a point on the map where "Gus Fruh Park" is printed (sorry, I forgot to set a waypoint). The creek was flowing VERY well that day, so we decided to stay on this side of the creek and turned towards a trail headed up along the hill slope. You can see this as our track turns to the right. Note that the slope of the land on the other side of the creek (where the marked trail lies) is far more flat. This part of the trail is a little tricky. It's obvious that many others have gone this way before, but it is not an officially marked greenbelt trail. Some portions are along very steep slopes where grabbing hold of a nearby tree branch is a good idea. Occassionally when the trees thinned out you're afforded great views of the creek below from 100-200 feet up (or so it seemed). It turns out that this is not the only way to continue hiking along this side of the creek, but it is the more challenging. For the next 1/3 to 1/2 mile or so the trail hugs rocky slopes and shelves along the creek. Once or twice we thought the trail may have ended since it is not always obvious from a distance where it is. You'll be rewarded for continuing though. Just before getting the last waypoint ("Water Falls") you'll come to two large rocks in the trail placed very close together through which you'll have to squeeze. If you're a big guy, breath in. Right after that you're at the bottom of a small valley fed by a stream. Another hiker told us about the waterfalls up hill so we followed the path of the stream up hill a good distance and we found half a dozen small waterfalls all along it's path. Some of the path is steep and started to get very muddy (read: slippery), so we stopped what appears to be less than half the distance from the top of the valley. On the other side of the valley the trail continues up a very steep slope. Grab onto a tree and take your time. We stopped our trip at this point as we thought the trail ended (a couple was sitting on top of the bluff overlooking Barton Creek and we could not see any continuation. Looks like we were wrong though as another hiker on the way back told us about a rock bridge of some sort a little further along the trail that we thought ended. Next time we won't stop there. On the trip back (not included in the track map) we hugged the creek bed more and found the easier route back. On our track just draw an imaginary line along the creek where we had earlier turned right towards the steeper slope. The hike was only about a mile out, but it was hilly, challenging and very entertaining. 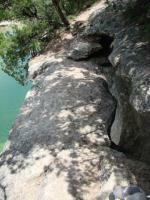 If you hike Barton Creek be sure to take some time and turn off of the beaten path. I've done "upper north" and this was tons better. We intended to do "Lower" but couldnt find the creek crossing and would up on Gus Froh. When you get to what APPEARS to be the end just after the creek & waterfall climb up to the top of the rock for the view. Then youll see a path and follow it and it goes miles further. Lots of ups and down, a SPECTACULAR view near one of the mountain climbing rocks, just a lot of fun. Entered Barton Creek near the Barton Creek Skyway acess. Nice hike but there were alot of teenagers around and they had started a small fire... just a little odd. It was close to dark and it was enjoyable to watch the sunset in the canyon. Challenging on a hot day! We hiked this area from the North. The bridge you refer to is at N 30° 14.535 W 097° 47.372. There is a cache there now called BridgeToTerabithia, although it had been muggled when we were there. (Just the bottom of the container and the log book left.) The bridge is really cool though, and the view is really great. It was nice and quiet once I got out on the more secluded trails. I saw an armadillo and a flock of 20 or so turkey vultures. The creek is completely dry, but overally the scenery was beautiful and the rocks were gorgeous. Great rock formations. Good swimming along the creek. A very nice trail. Cooler weather made even an old dog frisky so Willow and I headed out to spend some time amongst the trees. We stuck to the "official" trail mostly though we did stray down to the creek every now and then to look at the waterfalls. One of these strayings took us down to a grassy bank where I sat in the sun and gazed up at the white rockface while Willow swam to and fro with a stick in her mouth. There were a few cliff swallows out. Also could see the remnants of climbing equipment so I guess this is a face folks scale though none were out today. On the return trip we paused beneath some cedar trees trying to get a glimpse of the birds peeping and fluttering above us. After staring up for a bit one landed in view - a cedar waxwing. A whole pack of 'em, in fact. Not the sort of bird you see at your feeder in town, so a nice surprise. I only met 3 joggers on the trail and the sound of MoPac-n-360 was easily dulled by the running water and wind in the branches overhead. What a lovely trail to be right here in town. Its true, you might stunble upon a hobo camp on trail, but they are usually pan handling during the day.